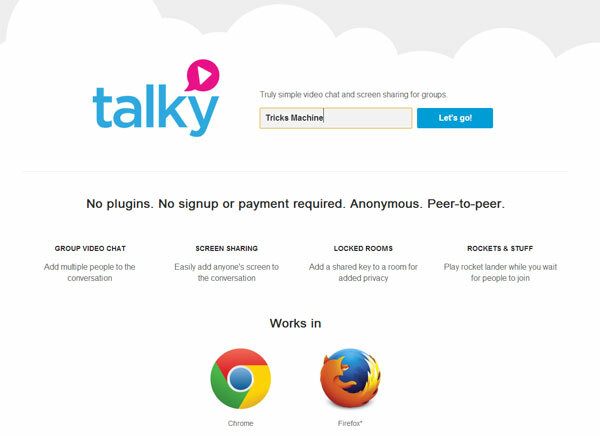 Talky.io is online service for Anonymous Screen Sharing for Groups in real-time audio and free Group Video Chat that does not require the installation of a plugin or special software. All you have to do is make sure that your meeting attendees use Firefox, Google Chrome or Chrome for Android. No installation or registration is required to arrange a video conference. Just go to talky.io to give a name for your video chat room and select a password if you want to lock your session. In a few seconds your video conference will be online. Then it will do more than invite your participants by sending them the URL of the meeting. Any participant may, if desired, share the screen of his/her computer. To activate the screen sharing, simply activate the feature on Chrome. You can find instructions here . talky.io offers little functionality. You can embed a password in your living room and video chat, share your screen and pause your webcam and microphone. Talky is extremely simple to set up and use solution. No technical knowledge is required. The Web service uses the programming interface WebRTC . This open communication protocol is supported among others by Google and Mozilla (Firefox). Moreover, Google plans to use the next few months on this protocol Hangout , its video conferencing system. Video conferencing services and screen sharing are extremely useful. They allow you to interact with your customers, partners, friends and family members. One of the strengths of a service like talky.io is that it does not require your participants install an app, plugin or they must register to access your meeting. Even participants who do not have administrator rights on their computers can use this service. I also suggest appear.in, this service is based on WebRTC offers similar functionality.